Also: I just spent way too much of my life trying to figure out how to get a clip of that onto the blog. Jay to the rescue. And now you can follow betondinner on Instagram! Maybe I’ll be better about updating it than my poor neglected Twitter account? Here we go: whisk flour, baking soda, baking powder, salt, and sugar in a bowl. Combine melted butter or oil with buttermilk and an egg. 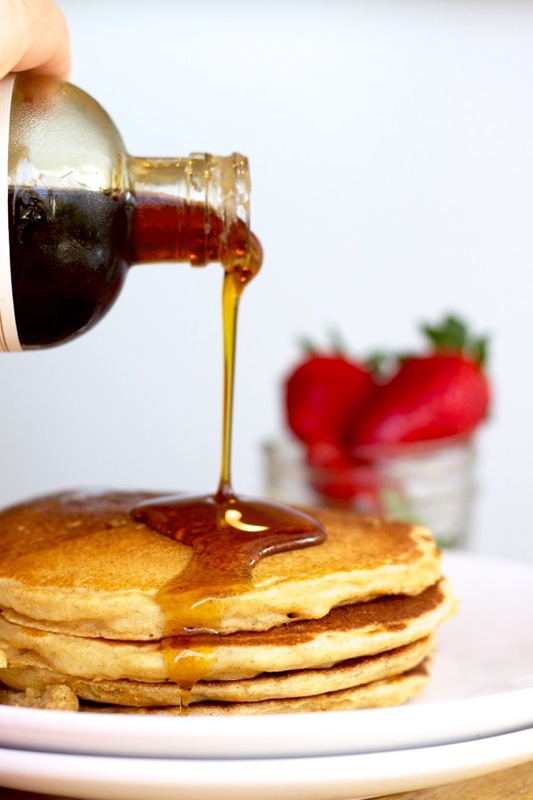 Gently stir the wet ingredients into the dry, and cook your pancakes! Blueberries are optional, but I love ’em! If you use frozen berries, they need to be a little thawed or there will be a pocket of undercooked batter around the berry. But I might actually kinda love that. My mom would always give us teeny tiny “pancakes” from batter drips, and I adore them to this day. My three-year-old loves the idea of eating six more pancakes! Aren’t they cute? 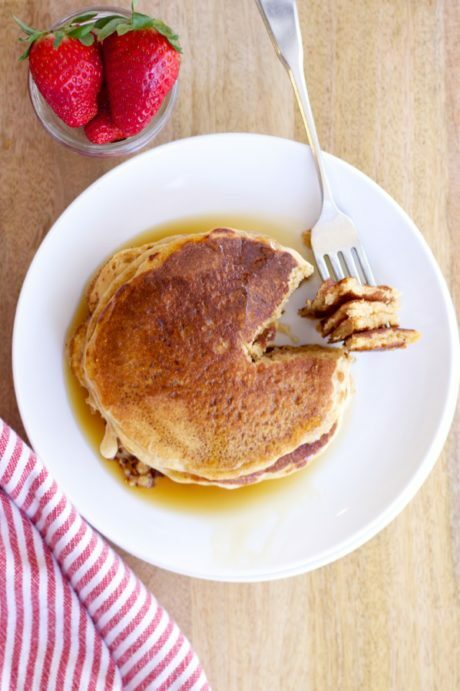 These whole wheat pancakes are easy to throw together and great for breakfast, lunch, or dinner – so make some pancakes real quick this weekend! Whisk dry ingredients in a large bowl. Combine the buttermilk, egg, and butter in a measuring cup. Add liquid to dry ingredients and stir very gently with a spoon or rubber spatula – the batter will be slightly lumpy! It should be a thick but pourable consistency – I usually need to add a splash more buttermilk or some regular milk to thin it a bit. Preheat and lightly oil a pan or griddle over medium heat. I use a 1/3 cup measuring cup to portion out the batter, but you can make them any size. If using blueberries or chocolate chips, sprinkle them on as soon as the batter goes into the pan. Cook for a minute or two per side – the pancakes are ready to flip when the edges start to look a tiny bit dry and cooked and the bubbles are slower to fill back in (or when they’re as brown as you want them on the first side). 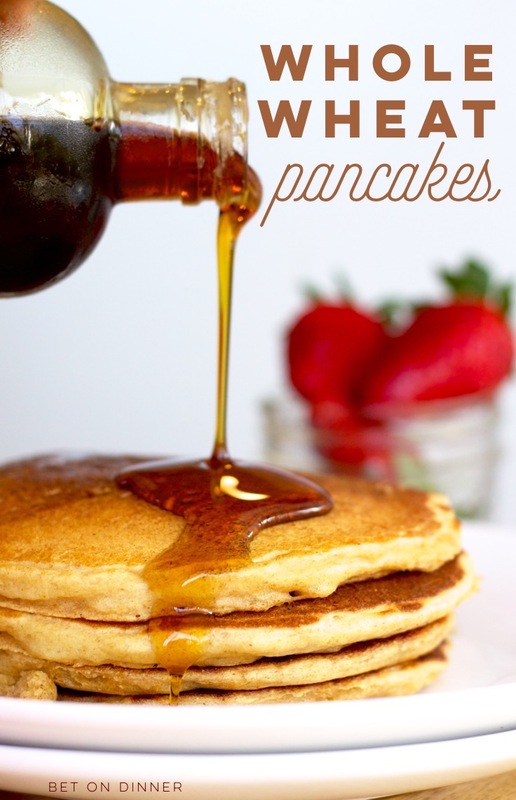 If I’m making these for our family, I make a double batch because I can eat A Lot of pancakes…and my three-year-old likes leftovers! I don’t personally like to freeze a large batch of pancakes because I don’t love them reheated and I don’t mind making them fresh when I want them. Parks and Rec for life! Watching that show always makes me want waffles. So much so that I asked for a waffle maker for my birthday. Haha. Ha! That’s awesome, Lindsay. I’m soo sad it’s the last season! I just bought some whole wheat flour. I will be trying this out very soon, maybe tomorrow morning. That’s great, Cynthia! Hope you like them! I use that white whole wheat flour in a ton of stuff these days, so I’ll try to post another recipe soon! I tried these and we all like them. I will definitely be making them again. Thanks. Have you tried fresh ground whole wheat flour? Hi Pam! I haven’t – I think it would work great, though! Maybe hold back some of the liquid at first/have some extra on hand in case you need to thin the batter out? I’m not experienced with grinding my own wheat so not sure if it would possibly absorb more or less liquid! ???? Bet, there is a store in GA that teaches how to bake with fresh ground flour. Their web site is very informative. They have regular classes that they video tape and post to their website that you can watch for free. They have everything one needs from the wheat to the mixers and everything in between. They also have a lot of articles that talk about the benefits of using fresh ground flour.